When I was sent home from hospital in 2004 following my subarachnoid haemorrhage (SAH), my consultant handed me a booklet from the Brain & Spine Foundation, telling me that they were good to get in touch with for support. I wasn’t given any advice on what to expect when I got home and because I looked okay and wasn’t given a follow up appointment I just assumed I’d go home and things would soon be back to business as usual. What a shock it was to discover that my brain would not work on auto-pilot and after the first night at home, on my own, I got up to make a cup of tea only to realise I had to work out every step of how to do it. So, I did what people do – googled subarachnoid haemorrhage. What I discovered terrified me even more – the morbidity rates quoted made me think I was probably going to die. I called my consultant who reassured me I was not and that I should take it easy and see how it went. Without any specialist support or advice I just pushed myself as hard as I could to get back to normal, went back to work after 12 weeks and crashed after 4 as I was expected to work full time after just a few weeks working part time. I was emotional and exhausted and eventually realised that something bigger was going on than I had expected. I checked out the Brain & Spine Foundation website and contacted the helpline and spoke to one of the nurses. At last I was speaking to someone who understood SAH. Whilst my GP was very kind, understanding and supportive, due to lack of specialist training, few GPs really understand the long-term impact of SAH, so the Brain & Spine Foundation were my only point of contact with specialist nurses who could advise me on what to expect. There are so few specialist support services for survivors of SAH and because we do not receive support it sends out the message that there’s probably nothing wrong with us, we should be “over it” and this makes us feel as if we are failing in some way or putting it on. We can be judged and it affects us in our personal and professional lives. If survivors were better supported outside the acute setting, we would not go on to develop some of the long term psycho-social problems associated with SAH, such as PTSD. I do not know where I’d have been without the Brain & Spine Foundation. I raised funds for them and in 2007, when I ran my first marathon - one of 5. I also contributed to Alison Wertheimer’s book a Dented Image Journeys of Recovery from subarachnoid haemorrhage. Brain & Spine Foundation are a small charity and receive no government funding. 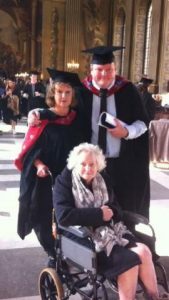 With their support I would not have gone on to achieve all that I have done including receiving in 2015 a first class honours degree in Health & Social Care – and I did my final project on recovery from SAH. The SAH conference the charity organised in 2016, and more recently a workshop for survivors with specialist speakers were extremely well received, and I have continued to learn more about the long term impact of SAH and how better to manage the long-term effects. The website provides excellent materials on this condition and the helpline nurses are just wonderful. Since the FB group was set up in November 2016, following the SAH conference, it has become very active and survivors and their relatives from all parts of the UK and abroad have found their way onto it. Survivors of SAH, some going back more than 20 years, have joined and are reassuring people who have recently had an SAH and are looking for support. We are able to share our stories and provide reassurance, understanding and support.